The top 20 riders in the finals, down from 120, absolutely threw down on Crabapple Hits early Thursday afternoon. 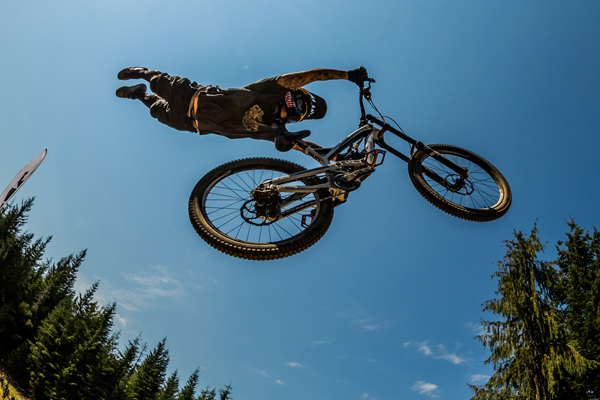 Casey Brown and Andreu Lacondeguy were named the 2015 Crankworx Official Whip-Off World Champions, making Brown the owner of the women’s division. Judge Duncan Riffle said competitors are judged on how far they whip it, how in control they can keep it, how big they go, and their overall fluidity. First-time champion, Lacondeguy, was giving it everything he had. Red Bull Joyride trail builder, Dustin Gilding, sent the crowd into a frenzy by whip-bonking a 'my mom whips better than you' sign twice, and received an honourable mention. Brown showed up to defend her title as World Champion, after winning in Crankworx Rotorua, by beating out some tough competition. The commentators remarked that Brown whipped so hard she was almost indistinguishable from the guys out on the course.